Question 2: Donʼt you have any ideas about adding other features like video viewing outside of gameplay? Tatsumi Kimishima answered that the Nintendo Switch is a “dedicated video game system” which is a fantastic response that I haven't really heard Nintendo give lip service to for over a decade since the GameCube era. NicoNico video streaming has been available for the Japanese since July 2017. Just today, a Hulu app launched in the North American Nintendo eShop. I think it's clear that Nintendo has ideas for other non-game-related features for the Nintendo Switch. Just... not anything resembling Miiverse. Question 5: Also, apparently Nintendo will be moving its online service for Nintendo Switch over to a for-pay model in 2018. What kind of reaction are you getting at this point? Kimishima also dodged this question. All he said is that the Nintendo Switch's online services will be better and customers will like them, but he didn't speak to what reaction people have. Since I am in contact with many gamers, I can answer this question for him. When it was first announced in January that the Nintendo Switch would have paid online, people reacted negatively and with a lot of doubt. Five months later, when the price point of $20 per year was revealed, much of the skepticism dissipated. People think that $20 a year is a reasonable price for what Nintendo is offering. If Nintendo actually improves their online service once they start getting paid, people will probably be happier than they are now. As far as I'm concerned, the Nintendo Switch's online has worse quality than it did on the Wii U, just by comparing the Wii U's Splatoon and the Nintendo Switch's Splatoon 2. There's something about the connection that is off and a lot weaker. If Nintendo is going to leave us with this quality and pocket the money, then it's bad. If Nintendo will just “improve” the service back to Wii U-levels and say, “Look, you're paying us and it's better now!” then that's kind of scummy, since that means they're intentionally having bad-quality online to make a point. We want a real improvement. Question 10: Please tell us about your thoughts on the future, and whether Nintendo might become a platform provider for its own smart-device applications. Oh boy, you want me to tell you my thoughts on the future? I think Cappy is going to end up being responsible for World War III, and Earth will be screwed and all of these questions will be totally pointless. The investor was trying to ask about the downsides of Nintendo being a third-party player on Apple and Google's smartphone and tablet platforms, compared to what Nintendo is used to where they own the platform and third-party developers pay Nintendo royalties. It may be difficult for investors to remember, but Nintendo already has a family of portable devices with many non-gaming functionalities. They're called the 3DS line. They pale in comparison to a smartphone in non-gaming capabilities because Nintendo's core competency is in gaming. Sure, you can make more revenue by selling your mobile games on a platform you own rather than going to Google or Apple, but who would buy a Nintendo smartphone that wouldn't just buy a Nintendo 3DS or Nintendo Switch? In other words, how do you get a person off the street to buy a Nintendo phone rather than an iPhone or an Android-powered phone? Let's not forget the colossal failure that Microsoft's Windows Phone is. A Nintendo smartphone would probably be like that... but worse. Nintendo already has trouble with third-party developers. You can sell a profitable game console with third-party troubles, but you cannot market a smartphone without massive legions of third-party app developers that do most of the software work for you. Question 13: What can you tell us about Nintendoʼs efforts going forward in relation to [eSports]? This investor wanted to know Nintendo's opinions on the eSports genre of games, though the transcript writes it as “e-sports” like one would write “e-mail.” I write eSports, so there. Anyway, the question is about the genre, not the spelling, though that would be a hilarious question if it was about spelling. Anyway, the investor did some homework and found out about Splatoon tournaments and competitive pro teams, like those featured at E3 2017's Splatoon 2 World Inkling Invitational Championships. Kimishima said that the sources of enjoyment for eSports — competitors enjoying the competition, and spectators enjoying spectating — are core to the Nintendo way of design. Then Kimishima very indirectly referenced the Nintendo World Championships when he stated that Nintendo acknowledges the eSports genre, but is trying to manage its own spin on it rather than behave like a traditional sponsor. Nintendo is also “thinking a lot about quite what kind of reward would make winners happy.” I don't know what that even means, and I didn't transcribe that quote wrong. Question 14: Nintendo has substantially increased its forecast for advertising expenses. What was the reason behind this increase? Kimishima answered this question very simply: Because Nintendo projects to produce more Nintendo Switch and then sell those additional Nintendo Switch, Nintendo also plans to spend more on advertising to achieve those sales goals. This is generally a very accepted rule in business-to-consumer transactions: If you want to get more sales, you need to invest more in marketing. More marketing budget means more sales. There's diminishing returns on marketing dollars and struggles to capture the exact return on marketing investment, but there's only so many more sales you can get if you don't increase the budget. There are lots of other questions that Ludwig didn't write a comment on, like several questions about China and more smartphone stuff. If you have any requests for Ludwig to talk about investor-y or financial-y stuff, write in the comments section. If you have any requests for KoopaTV to write on any other topic, write in the comments section of the dedicated Requests page! You could improve YOUR own personal finances by participating on KoopaTV, thanks to the KoopaTV Loyalty Rewards Program! Requests are just one way to rack up points for that. Click here for the KoopaTV analysis for when Nintendo's first quarter of the 2017—2018 fiscal year ended. Based on the Nintendo Switch's spectacular holiday performance, Nintendo should be on their way to meeting their demand goals. Nintendo has met their demand goals as of the third quarter! The next time there's an article on the financial Q&A session, it not only includes Kimishima, but also his successor! The last time Kimishima answers dumb investor questions as president of Nintendo. The Switch will likely outsell the Wii U's lifetime sales in it's first year. That's insane. There were quite a few gems on the system that I thought would be huge system sellers, but they never picked up as much steam as I thought they would. Some of my favorites include Splatoon, Donkey Kong Country: Tropical Freeze, Pikmin 3, Super Mario 3d World, Super Mario Maker, The Wind Waker HD, and of course Super Smash Bros. I still occasionally play Splatoon, but now that Miiverse if officially defunct, the game will not quite feel the same. 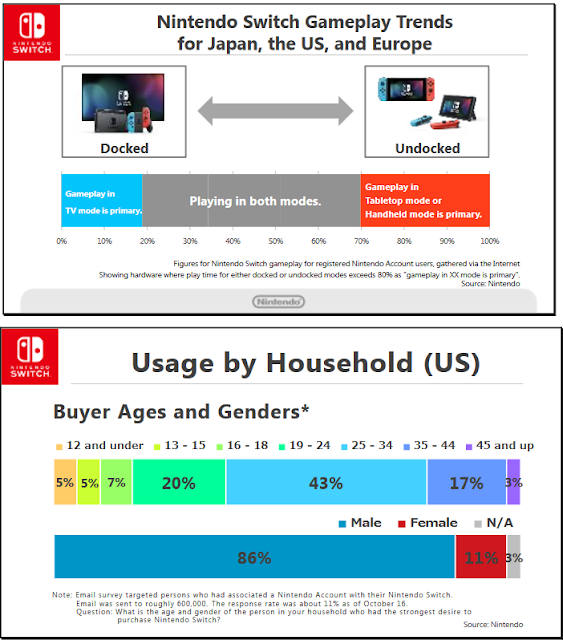 Nintendo kept referring to people embracing the Nintendo Switch's value story and proposition, the playing anywhere and anytime thing, and that it's resonating with people. It's a very different tune than when the Wii U was Nintendo's system. They never spoke in those terms. The 3% is part of the undiscovered egg group. Do they get put in 12 and under?